Spend enough time developing software on Mac OS X, and you will eventually need to install libraries that were written for Unix, but not specifically for OS X. Fortunately we have Homebrew, which makes it easier to install Unix libraries on the Mac. Before installing any new software, it is helpful to have a clear view of why we need it. 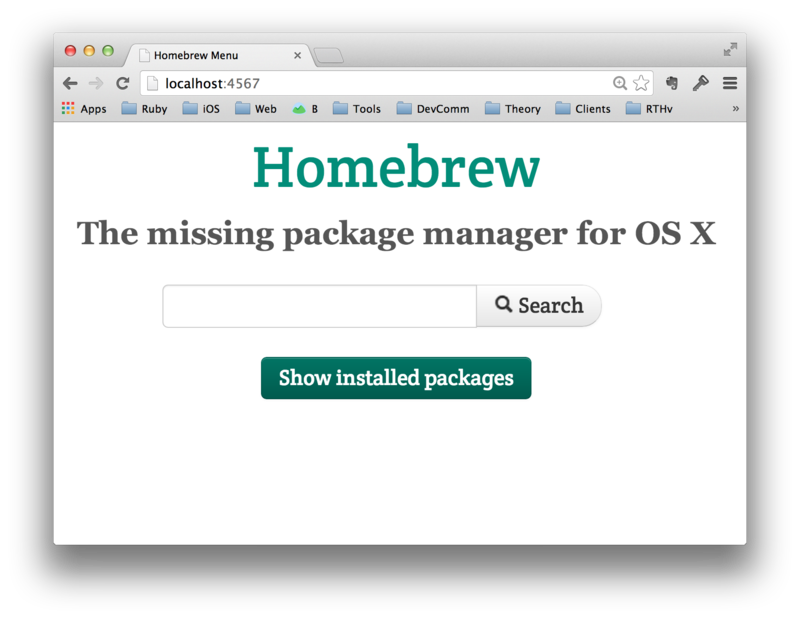 Homebrew is a package manager. It differs from earlier package managers like Fink and MacPorts because it is written in Ruby and based on Git. The Ruby/Git foundation means that developers from around the planet can easily contribute to Homebrew’s growth. Manually download source code for the library. Manually compile using gcc or another compiler. Manually, manually, manually… The old way was long and error-prone. Max Howell created Homebrew to download, compile, and resolve dependencies automatically. Now developers can focus more attention on solving problems that are directly related to their work. Some parts of Homebrew require Xcode, Apple’s environment for developing software on Mac OS X. Make sure you have Xcode installed on your Mac. Xcode is available for free in the Mac App Store. With Xcode installed, you can install Homebrew by pasting the following command into a terminal window. The script will walk you through the installation process. If you would like to read the script before installation, you can visit the Homebrew repo on Github. A list of available Homebrew packages is maintained on GitHub. Before Homebrew, installing imagemagick was long and arduous. With Homebrew, the installation and compilation steps still take awhile. But dependencies are resolved by Homebrew, and little user interaction is required after the first step. Developers from around the world contribute to Homebrew, so the tool gets improved often. To check the health of your Homebrew installation, use brew doctor. brew update will apply recent updates. Updated Homebrew from f83642fc to cfad513e. There are several ways to view the packages that have been installed on a system via Homebrew. Use brew list at the command prompt to get a quick view of what Homebrew has installed. Even better: brew server will launch a local Sinatra app, and then you can point a browser to http://localhost:4567 for a web-enabled view of the installed packages. Homebrew is Ruby-based, so Rubyists can create their own packages. Details can be found in the (continuously updated) Homebrew repo on GitHub.